Most children in the United States that were born between the late sixties and the early nineties watched Mister Rogers’ Neighborhood. Most can probably still remember all the words to the theme song. The format of the show was uncomplicated and yet profound. This kind man presented a show that transcended anything else in television history because at the core of his program there was a depth of thoughtfulness and a patient discipline. His agenda was all about showing children what virtuous behavior and compassion look like in everyday life. He embodied the kind of person who should be in every child’s life in a world that is dominated by irony, cynicism, and greed. Fred Rogers was convinced that the things that had taken center stage in society were not the things that mattered most at all. And so he made it his mission to teach children how to value those things that were invisible to the eye because those were the essential things. At the heart of his work was the need to form positive human connections. The show aired 895 episodes from 1968 to 2001. Many times the program was about simple interactions between adults or investigating every-day objects and processes. However, he also often explored difficult topics in honest ways that were also emotionally safe. Fred used his own vulnerability to model for children how we are affected by the deeper occurrences in life such as the death of a loved one or a pet. He shared his stories and in so doing, he shared his heart. Silence and stillness were Fred Roger’s most powerful tools and he used them brilliantly in each show. He was convinced that real revelation comes through silence and that children needed to be taught to embrace stillness in their own lives. 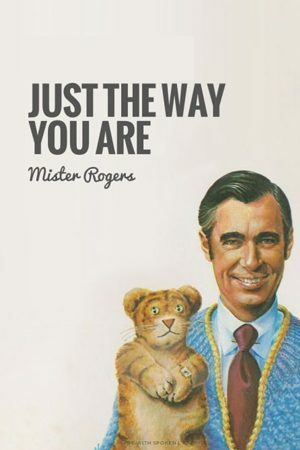 Mister Roger’s Neighborhood was all about depth and integrity. He wasn’t preoccupied with ratings, he was happy to influence just one child. We live in a noisy world in which we are constantly bombarded with information and sounds to the point where reflection has taken a back seat in many minds. Mr. Rogers was a breath of fresh air in a world that has become obsessed with stifling its own voice. He truly taught children the things that are fundamental to our experience as human beings. Watch this beautiful tribute to a wonderful man.